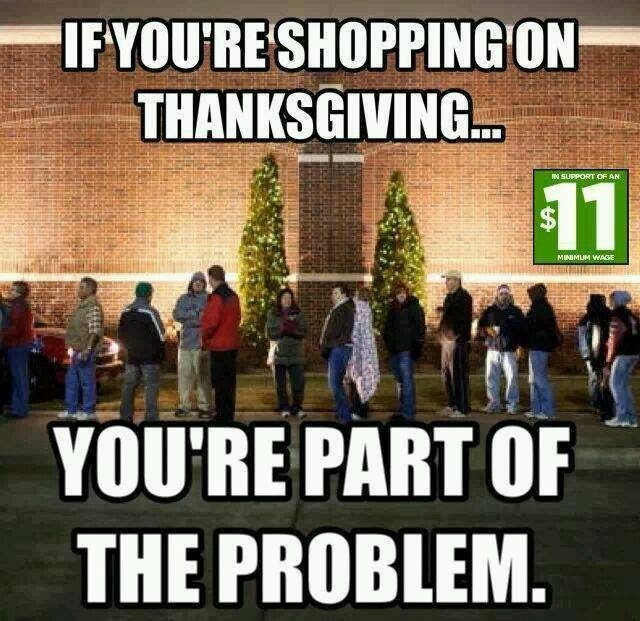 The implication is clear: shopping on Thanksgiving is unethical. If you disagree that this is the implication, then you might be unaware of the broader "Facebook issue" (it turns my stomach to use a phrase like that) that is out there right now. There is a broad sense out there that shopping on Thanksgiving is morally wrong because it "forces" employees to "leave" their families and their holiday celebrations in order to serve us shoppers. Or, to put it another way, it's wrong to deprive someone of a holiday experience just so that you can get a good deal on some consumer goods. For all of you who sympathize with this idea, I have a question: How low must a price be before you would be convinced that it's okay to shop on Thanksgiving? The answer to this question is far from obvious. Take a price of "free" for example: Let's say you could get a free TV if the only way to get it was to pick it up from the store on Thanksgiving Day. Would it be ethical to take the TV? You might say that it is still unethical, but consider the fact that many people are too poor to afford a television. Is it ethical for them to shop for a free TV on Thanksgiving? I presume that the answer is yes: It is fully ethical for the poor to obtain something for free by shopping on Thanksgiving. This is not just common sense inference (although it is that, too), it is a belief for which I have strong evidence in the fact that every year, thousands of volunteers freely pull themselves away from their families and holiday festivities at home so that they can volunteer at the local soup kitchen. If it is ethical for a homeless person to turn up at a soup kitchen for a free meal on Thanksgiving - and thereby pull innocent people away from their families, etc. - then it is likewise ethical for a poor person to shop for a free TV on Thanksgiving. There is perfect comparability between these two situations. I have now established that a price of free is low enough to justify the moral case for shopping on Thanksgiving if the customer is sufficiently poor. I assume raising the price of the TV to $1 (approx. 1% of the price of a reasonably acceptable television) or raising the price of Thanksgiving dinner at a soup kitchen to 1% of the consumer end-price (say 5 cents) would not be a significantly meaningful price increase to affect the morality of the situation. Thus, I have now established that at significantly low non-zero price and poverty levels, shopping on Thanksgiving is perfectly ethical. And that, my friends, is all I need in order to establish the ethics of Thanksgiving shopping. Remember that not everyone in the world is as rich as you are. Some people can only afford Christmas presents for their children if those presents are deeply, deeply discounted. The exact value of that discount is irrelevant. That is, it does not matter much how low of a price we're talking about, nor "how poor" a person has to be before we collectively agree that they can shop, even if others can't. The exact price- or poverty-level is irrelevant because it is subjective, and up to every person to determine for himself/herself. We are not really talking about "rampant consumerism." I agree that people who are well-off enough to be able to skip the shopping and spend that time with friends and family certainly ought to do so. But who are you to say which one of us legitimately meets that criterion? It's subjective. Please note that I have not even touched the other side of this issue, which is that some people are so poor that they need to work on Thanksgiving Day in order to meet an acceptable living standard. Those people have a right to work that day without having to hear your whiny story about how they'd be better off losing a day's work in exchange for some TV football. Anyway, the bottom line is that we should keep everyone's moral decisions in mind when we blather about morals on Facebook.